The Rev. Dr. Geoff Tunnicliffe, former secretary general of the World Evangelical Alliance and chairman of the Advisory Board of Christian Media Corporation, said in an interview with The Christian Post Tuesday, that there was a John 17 spirit during the two meetings he had with Pope Francis. Tunnicliffe noted that formal meetings with the pope are often said to last only 30 minutes but one informal meeting with Francis and Evangelical and Charismatic leaders lasted over two hours. Those at the gathering sensed the presence of God, according to Tunnicliffe, and a unity of the Spirit as their discussions focused on Jesus Christ even as they talked about theological differences. "These theological discussions have to take place in the context of relationship. Otherwise they become cold. And we are thankful for those opportunities where it is about building friends, while not dismissing the theological distinctives," the former WEA leader explained. These relationships are what "help create the framework for the deeper discussions as well." 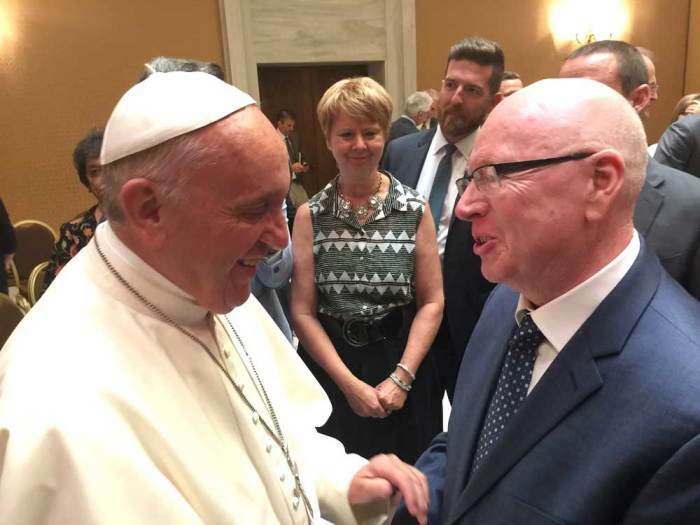 Italian Pentecostal minister Giovanni Traettino was one of the key conveners of these meetings with Francis, with the two having enjoyed a steady friendship over many years. In July 2014, Pope Francis traveled to Traettino's Church of Reconciliation in the southern Italian city of Caserta to apologize for the persecutions Pentecostals experienced at the hands of Roman Catholics. As was widely reported at that time, Francis, whose papacy had just begun the previous year, said: "I ask for your forgiveness for those who, calling themselves Catholic, didn't understand we're brothers," and called for a "Church that is one in its diversity." Tunnicliffe mentioned in the interview with CP that these kinds of apologies were reciprocated by several Evangelicals in the meeting who had themselves mistreated Catholics in their respective communities. Those gathered articulated the need for greater reconciliation in the Church as a whole, emphasizing the desire to see Christ's prayer in John 17:20-23 be fulfilled. "My prayer is not for them alone. I pray also for those who will believe in me through their message that all of them may be one, Father, just as you are in me and I am in you. May they also be in us so that the world may believe that you have sent me. I have given them the glory that you gave me, that they may be one as we are one — I in them and you in me — so that they may be brought to complete unity. Then the world will know that you sent me and have loved them even as you have loved me." Pope Francis also reached out to Evangelicals and show a spirit of unity through the Together 2016 event, with news last week that he will record a greeting for next month's rally that seeks to bring 1 million Christians for prayer and worship at the National Mall in Washington, D.C. The Together 2016's website reads: "Jesus directly challenged a culture of division. He prayed we would be one — one family, one body. And He told us to love our enemies. Everyone loves their friends; it's when we love those who aren't like us that the world takes note. It's time to come together around Jesus in a counter-cultural moment of unity and love for each other." Tunnicliffe concluded, "I don't think we have to wait another 500 years for another Reformation. God is doing some amazing things around the world for which I am thankful."